WHAT ARE THERMOSETTING PLASTICS ? Once heated and moulded, these plastics cannot be reheated and remoulded. The molecules of these plastics are cross linked in three dimensions and this is why they cannot be reshaped or recycled. The bond between the molecules is very strong. Many adhesives (glues) are thermosetting plastics. 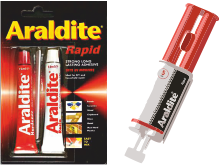 For example, Araldite. Composed of two tubes (one is resin, the other a catalyst). They are mixed to form the glue. Polyurethane. This forms the basis of many paints and varnishes. Tough, water resistant. Melamine Formaldehyde. 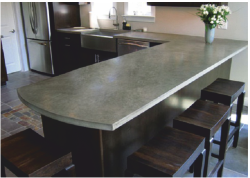 Because of its smooth surface and hygienic qualities, used for kitchen laminates surfaces. Also used for electrical plugs and sockets, because it can be cast and it is an excellent insulator. Urea Formaldehyde has physical properties of high hardness and high toughness, making it suitable for strong, knock-resistant electrical fittings. It is also scratch resistant and a very good electrical insulator. Electrical fittings manufactured from this polymer are safe to use. Polyester resins. If resins are combined with a material such as fibre glass, the result is a very tough material that can resist impact. Known as Glass Reinforced Plastic (GRP) and is used in car body repairs, sailing boats and corrugated sheet, because of its lightness, toughness and resistance to water. Thermosetting plastics once heated and formed to a shape, cannot be reheated and reformed. Consequently, they tend to be difficult to recycle. Thermoplastics once heated and formed to a shape, can be reheated and reshaped. Every time they are reshaped, the quality of the thermoplastic tends to be reduced. 1. Complete the paragraph on thermosetting plastics, by adding the missing words. Once ________ and moulded, these plastics ­­­___________ ___ reheated and remoulded. The molecules of these plastics are _______ ________ in three ___________ and this is why they cannot be reshaped or recycled. The bond between the ___________ is very strong. 2. Name a glue that is a thermosetting plastic and describe how it is mixed. 3. Name a plastic that is used as the basis of many paints and varnishes. 4. Why is Melamine Formaldehyde used for the manufacture of electrical plugs and sockets? 5. Urea Formaldehyde is also used for the manufacture of electrical plugs and sockets. Why ? 6. Complete the sentence about polyester resins, by adding the missing words. Polyester resins. If _______ are combined with a material such as ________ ________, the result is a very tough material that can resist impact, known as Glass ______________ Plastic (_______). 7. Why are polyester resins used in car body repairs, sailing boats and corrugated sheet. 8. What is the difference between thermosetting plastics and thermoplastics?